Judy Woods: That’s a knife case? Eliza Jones: Saay leł [knife sheath]. What’s your word for that? Trimble Gilbert: Shrįį dhah [knife case]. Shrįį is a knife. Shrįį dhah [knife case]. 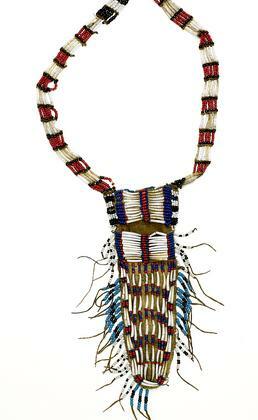 Naagąįį shrįį dhah [beaded knife case]. Eliza Jones: When there’s ceremony going on, that’s when they would wear this one. Trimble Gilbert: Yes, I think that’s for special ceremonies. Eliza Jones: It goes across [the chest] like this. I think it would hang down on the left. Trimble Gilbert: When I was in Denakkanaaga [Athabascan Elders organization], they gave me one. I was First Chief or Second Chief that year, and they gave me one like that. I put it on, but then one old lady said you have to wear it other way. Eliza Jones: Yes, that’s the side you’d pick up your knife from. They have to wear it a certain way. Trimble Gilbert: A certain kind of knife they use with that. Eliza Jones: Neełkk’aa tl’otl’eghe [knife with the handle split and curled in opposite directions (double spiral)] I think. Matthew Gilbert: Where did they get the beads from? Trade? Eliza Jones: Yes, it would have to be trade. And those were very, very valuable. Trimble Gilbert: And this is moose skin? Eliza Jones: Mm-hmm. This [shells], we’d say is k’etl’ene’ [dentalia].